This section describes how to configure an authentication policy in Policy Studio for API Gateway to authenticate to CA SiteMinder. For more details on working in Policy Studio, see API Gateway Policy Developer Guide. In the node tree, click Environment Configuration > Authentication Repositories> SiteMinder Repositories. Select Add a new Repository, and enter a name for your repository (for example, SiteMinder repository). Set Agent Name to the agent you registered (GatewayAgent), and click OK.
For more details on the fields and options in this configuration window, see CA SiteMinder repositories in the API Gateway Policy Developer Guide. In the node tree, click Policies. Add a new policy , and enter a name for it (Route to protected resource). Open the Routing category in the palette, drag a Connect to URL filter onto the policy canvas, and enter a name for your filter (Route to protected resource). Enter the URL for your protected resource, and click Finish. Right click the filter, and select Set as Start. The SiteMinder authentication and authorization policy calls to this protected routing policy using a Policy Shortcut filter. This sections describes how to configure a policy to authenticate and authorize an end user existing in a CA SiteMinder repository. To start, add a new policy named, for example, SiteMinder. Open the CA SiteMinder category, and drag a Authorization filter onto the policy canvas. Enter a name for the filter (for example, Authorize user with SiteMinder), and click Finish. For more details on the fields and options in this configuration window, see SiteMinder authorization in the API Gateway Policy Developer Filter Reference. Open the Utility category, drag a Policy Shortcut filter onto the policy canvas. Set Policy Shortcut to the routing policy you created (Route to protected resource), and click Finish. Click on the Add Relative Path icon to create a new relative path (for example, /siteminder) that links to this policy. Deploy the new configuration to API Gateway. API Gateway authenticates the end user using HTTP Basic. 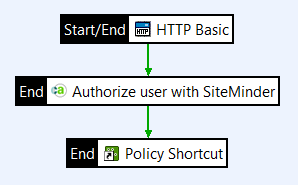 API Gateway passes the end user’s credentials to SiteMinder. SiteMinder authenticates the end user, authorizes the end user for the particular resource, and sends a response to API Gateway. API Gateway routes the request to a policy shortcut calling the protected resource.